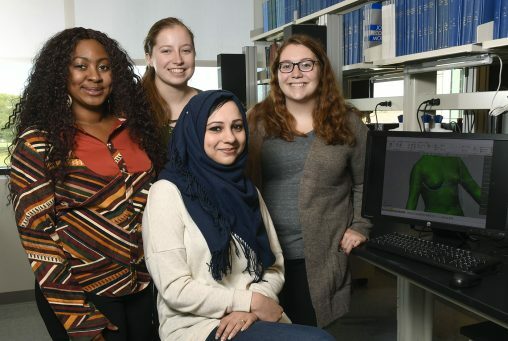 From left: Engineering students Lazette Carter, Nicole Robinson, Farah Hamandi and Rachel Bailey are collaborating on a research project to design a better bra. Nearly 80 percent of women wear the wrong bra size, often causing pain in the back and core, as well as a consistent feeling of discomfort. Wright State engineering students Farah Hamandi, Rachel Bailey, Nicole Robinson and Lazette Carter aim to fix the problem through a collaborative research project. Originally, Bailey and Robinson, both senior biomedical engineering students, planned to study the materials used for breast implants. But Tarun Goswami, professor of biomedical, industrial and human factors engineering, suggested they shift the focus and goal of their research to the bra itself. So the undergrads began to work with Hamandi, an engineering grad student, and Carter, a biomedical engineering grad student, on a graduate-level research project. “Instead of just doing a research paper, he suggested we do research ourselves on the mechanics of bra materials to try and see if we can create an idea that will benefit the science community,” Bailey said of Goswami. There are many different aspects to the project, such as analyzing breast tissue, reviewing patents of bra designs and learning about different materials used to produce bras. Robinson is researching tissue and Bailey is in charge of researching materials. Both Robinson and Bailey are excited to be part of research that they hope could make an impact on the way bras are created and manufactured. Hamandi said a significant problem for sizing bras is the fact that female bodies are not often symmetrical in size. As a result, a bra may fit on one side or be too tight or too loose on the other. Another common problem is an underwire. Bailey said that an underwire can affect a woman’s skin by putting too much pressure on too little an area. To fix this, the group is experimenting with different types of metal, as well as 3D printing an underwire. They hope to recruit 100 women for a study. They will give each woman a survey and take measurements using a 3D scanner. Robinson said that working on this research allows her to use what she’s learned in class in a real-world scenario. “We’re taking what we know about statics analysis and physics, biomechanics and things like that, being able to use it for something super meaningful, that’s kind of a rare chance,” she said. Participate in the study by emailing brg@wright.edu.